we may be able to do something more: feel anew. I was born to ramble, born to roll. Writers who employ qabalistic and other literary devices to transmit multi-layered meanings of imagery and information will sometimes dangle blatant clues encouraging the code-breaking reader to look in that direction. They start with basic and obvious correspondences to draw attention' then increase the complexity of the associations. Decoding this multi-level writing encourages the reader to develop puzzle solving skills and to eventually become maze-bright. Learning to negotiate and solve puzzles and mazes of any kind helps develop the skill set for solving more difficult mazes.... such as life ... and death. Qabalistic subtext, among other things, involves the transposition of letters into numbers. Each number carries a variety of different avenues of interpretation, different meanings, conrespondences and connections as listed in the standard qabalistic dictionary, 777 and other Qabalistic Writings of Aleister Crowley. This essay presents the argument that Gilles Delueze, at times, communicates qabalistically, a discovery I first made in The Logic of Sense. Qabalah actually serves as a logic of sense, but by no means the only one. The experimental nature of Deleuze's masterpiece, The Logic of Sense, becomes immediately apparent upon seeing the Table of Contents where the sections get structured as numbered sets of Series rather than Chapters. This transposition from Chapters to Series befits both the nonlinear and dynamic nature of the subject material. Any given subject doesn't necessarily begin with its designated Series, nor does it conclude at the chapter's end. Each Series comprises a discrete block of subject material, a line of thought, that overlaps, interconnects and runs parallel to all the other series. We envision an analogy with electronics - the two basic electrical circuits being series and parallel. The first number/letter correlation that caught my attention and tipped me off to the code was the Twenty-Sixth Series of Language. There are 26 letters in both the English and French alphabets. That's what I mean by a blatantly obvious correspondence between number and subject. Anyone remotely literate in either of these languages knows they have 26 letters in their alphabetr, you don't have to be a certified qabalist to see that. There seems a reason that Deleuze made language the subject of the 26th series. I suggest this widely known, simple correspondence, to be a hint to look for more complex relations. The next rung on the ladder comes right away: Twenty-Seventh Series of Orality plugs in directly to the qabalistic grid. The framework for this grid is known as the Tree of Life. It contains 10 Sephiroth (spheres of influence) and 22 paths connecting these spheres. They get arrayed on three vertical pillars, The Pillar of Mercy, the Middle Pillar, and the Pillar of Severity. Each path gets assigned a Hebrew letter. Also, each path and each Sephiroth has a key number, 1 to 10 for the Sephiroth and 11 - 32 for the paths. I'm giving this very basic outline for the beginning qabalist to demonstrate the significance of 27 and orality. In the spirit of increasing complexity, more info on this esoteric language will be given in due course. Each letter of the Hebrew alphabet is given a name that suggests a "pictorial glyph suggested by the shape of the letter." For example, the first letter Aleph "means an Ox, principally because the shape of the letter suggests the shape of a yoke." The 27th key corresponds to the Hebrew letter, פּ‎, - Pe (pronounced "pay') - "a Mouth, is explained by the shape of the letter. The Yod represents the tongue." (quotes from 777 ). 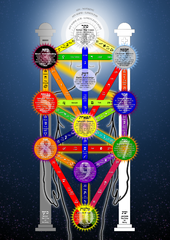 The Twenty-Seventh Series of Orality presents an explicit association with Qabalah. Key 27 is the exact place to start if one considers Deleuze a philosophical beacon for Thelema. This key corresponds with the tarot trump The Tower also called War. "The picture shows the destruction of the existing material by fire." (The Book of Thoth). Relate that to Deleuze taking up and continuing Nietzsche's project of overturning Platonism, his criticism and rejection of Hegel's dialectic or of Descarte's cogito (i.e "I think therefore, I am"). Deleuze has been at war with and sought to destroy conventional assumptions in mainstream philosophy right from the start of his career. One of his key concepts for breaking with past convention of any kind is the War Machine which he developed and wrote about with Guattari in A Thousand Plateaus. More on the War Machine and Magick here. 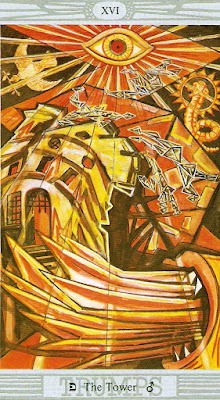 Crowley's Tower card has a large eye at the top which he implies is the opening of the Eye of Horus - the gnostic, experiential introduction of Thelemic cosmology. The popular introduction to Thelema masked as one of the best Science Fiction books ever, Robert Heinlein's Stranger in a Strange Land contains much symbolism of the path of Pe. This may be the best path to introduce Thelema because it is the first path that crosses the vertical pillars to connect the Sephira Hod on the Pillar of Mercy with Netzach on the Pillar of Severity - the intellect (Hod) with ordinary emotions (Netzach). It also connects the element Water (Hod) with Fire (Netzach). More on that later. The balance and uniting of the three lower centrums, the physical, emotional, and intellectual in a common direction produces real Will, according to Gurdjieff. Immediately north of the path of Pe on the Tree is what's called the Veil of Paroketh. The Book of the Law indicates three grades in Thelema: the Hermit, the Lover, and the man of Earth. Coming just below Tiphareth and above Pe, the Veil of Paroketh separates the grade of the man of Earth from the Lover. The man of Earth begins the process 'know thyself" - self-observation, self-study etc. and begins formulating their True Will. The Lover grade gets attained when passing through the Veil of Paroketh to reach the solar emanation Tiphareth. The veil represents the obstacles to that. This veil is symbolized in Biblical scripture in Mark 15:38: "And the veil of the temple was rent in twain from the top to the bottom." This occurs at the moment of JC's death on the cross, or as they say, when he "gave up his ghost." This death/rebirth motif appears a basic tool in the Thelemic war machine of Initiation and represents a major apsect of the symbolism of the path of Pe. Back to The Logic of Sense: the series/parallel nature of the book already becomes apparent with the increasing numerological complexity between Series 26 and 27. They follow each other in the Table of Contents in serial fashion while the occult series of qabalistic subtext runs parallel to the literal text. The next series demonstrating increasing qabalistic subtlety to this eye is: the Fourteenth Series of Double Causality. Key 14 signifies the path of Daleth and connects the sephira of Chokmah with Binah, the archetypal Father with the archetypal Mother - double causality. This represents the third and topmost crosspath on the Tree of Life. It also connects the root of Fire (Chokmah) with the root of Water (Binah). Series 27 and 14, the lower and higher crosspaths in the Tree of Life, appear the only two that show an obvious qabalistic link between its number and title. That it happens to be these two paths so indicated has much personal significance for me because I got an instruction very early, as a student of this Art, to examine the relationship between these two paths. I thus associate these two paths with beginning studies of this kind, so find it synchronistic that Deleuze also begins here. Still with the Table of Contents: other Series titles have no obvious correlation with Qabalah in its universal form, however, every unorthodox practitioner of the Art devises their own lexicon based on personal experience and individual associations. For moi, the Sixth Series on Serialization indicates an advanced look at Tiphareth (key 6). The first sentence in this Series: "The paradox of indefinite regress is the one from which all the other paradoxes are derived." strongly resonates with the function of Tiphareth along with the prime directive that to go anywhere in the macrodimensions one must first pass through the heart of the Labyrinth. (Labyrinth terminology originates from Nietzsche: "If we had to venture upon an architecture after the style of our own souls, a labyrinth would have to be our model. That music which is peculiar to us, and which really expresses us, lets this be clearly seen." - The Dawn of Day). As mentioned, The Logic of Sense comprises a collection of Series. 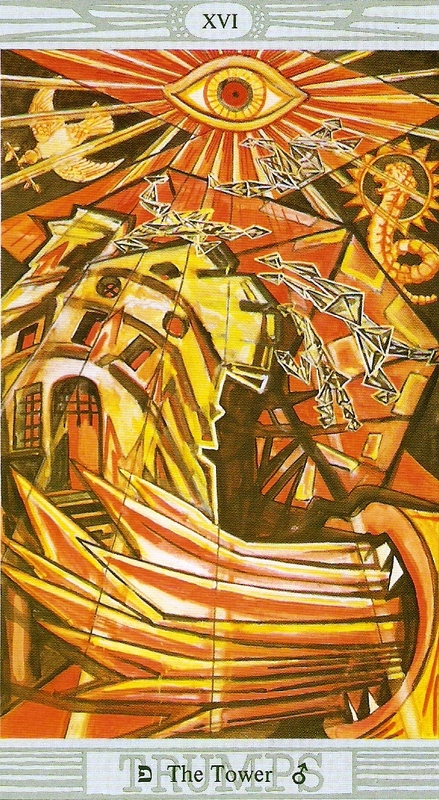 The Sixth Series on Serialization beginning as it does with "indefinite (not infinite) regress" suggests that the whole book embraces an indefinite solar invocation. An indefinite regress seems far more experientially accurate than an infinite regress in the multiplicities of experimental solar invocation. Every Series starts its title with a number followed by the word "of;" for example, First Series of Paradoxes of Pure Becoming etc., except the Sixth and Twentieth Series which has the Series number followed by the word "on." Long time readers of this blog, as well as adepts with Crowley's linguistics, will recognize the word "on" as one of Crowley's magical formulas. I suggest that Deleuze was aware of this; this formula relates to Tiphareth, one could say that it's solar powered. The Twentieth Series on the Moral Problem In Stoic Philosophy concludes its synopsis in the Table of Contents with: "To understand, to will, and to represent the event;" a phrase that speaks as equally well to the ON formula. The Twenty-Third Series of the Aion has a synchronistic association for me. 23 will be forever connected with Robert Anton Wilson who wrote about the 23 Conspiracy in Cosmic Trigger Volume I. Readers who followed Wilson down that particular rabbit hole report experiencing many unusual coincidences with that number which has been my experience as well. Wilson wrote that it was 23 which cracked the Cabalistic (as he spells it) DNA code for him. It was also an entry point for me. The Twenty-Third Series is about time. It begins: "From the start, we have seen how two readings of time - time as Chronos and time as Aion - were opposed." Wilson reports in Cosmic Trigger that his Holy Guardian Angel communicated mostly through synchronicities and that a lot of the messages had to do with the paradoxes of time. During the period of July 1973 to October 1974 he says that he was frequently in contact with a nonhuman entity or entities unknown:"But the entity always intently urged that I should try to understand time better." (italics in the original). Timothy Leary's story and work also feature prominently in Cosmic Trigger and he wrote the Forewards. He also had great interest in the paradoxes of time. The Forewords end with: "We thank-you, Robert Anton Wilson, for this timely and time-full treasure." Timely sounds like Chronos as Deleuze describes it, while time-full accurately describes Aion. Let it roll,..... all night long. We finally arrive at the Preface. Deleuze lets on his qabalistic intent by hiding it right out in the open like Edgar Allen Poe's, The Purloined Letter, which Deleuze specifically references elsewhere in his oeuvre. The first sentence of LoS reads: "The work of Lewis Carroll has everything required to please the modern reader: children's books, or rather books for little girls; splendidly bizarre and esoteric words; grids; codes and decodings; drawings and photographs; a profound psychoanalytic content; and an exemplary logical and linguistic formalism." Aleister Crowley includes Carroll's Alice in Wonderland, Alice Through the Looking Glass, and The Hunting of the Snark on his reading list with an identical comment for each piece: "Valuable for those who understand the Qabalah." Even as he lists this recommendation, Crowley simultaneously communicates qabalistically ... for those who understand the Qabalah, - a lot easier than people imagine. A frequent metaphor given to a student entering an esoteric school is that of going down the rabbit hole to the topsy turvey world of Wonderland. This was illustratrated on the big screen in The Matrix which borrowed heavily from various esoteric school sources. Neo literally gets told to follow the rabbit, and he does, leading him completely underground and out of the computer simulated world illusion he's accustom to living in. We find The Matrix one of the best contemporary qabalistic allegories for the genesis of the Ubermensch right from the first scene, which literally spells out its beginning from the Heart of the Labyrinth; hidden right out in the open like The Purloined Letter. Another excellent genesis film is Mel Brook's Young Frankenstein. The genesis allegory in Young Frankenstein was used to great effect in the recent documentary series Long Strange Trip about the Grateful Dead. Along with the just mentioned Labyrinth clue in this two minute scene, we see a quick graphic representation of the Veil of Paroketh (or any bardo space, for that matter) at the end of the numerical display. There's also a possible oblique reference to Alice in Wonderland if we can imagine that the writers read the opening words from LoS posted above. Deleuze began his studies of nonverbal communication systems at least as early as his 1964 book Proust and Signs in which he creates a taxonomy of symbolic communication, i.e. signs, based on the magnum opus In Search of Lost Time. As one description puts it: "Deleuze reads Marcel Proust's work as a narrative of an apprenticeship of a man of letters. Considering the search to be one directed by an experience of signs, in which the protagonist learns to interpret and decode the kinds and types of symbols that surround him." This, of course, perfectly describes the qabalistic method. It shouldn't be surprising that after classifying Proust's use of signs, Deleuze plants coded linguistics into his own works. Another fairly straightforward clue that Deleuze utilizes Qabalah for the basis of some of his coding comes when he examines the linguistic process of schizophrenic writer Louis Wolfson. Wolfson had a pathological aversion to his native language, English, so he invented a process of immediately translating every English word into a foreign word with a similar sound and sense. Deleuze begins this section with a solar invocation (i.e. reference to Tiphareth) which could simply seem coincidental until we dig a little deeper. He starts: "... let us examine another text whose beauty and density remain clinical." (beauty = Tiphareth). He then provides some analysis before choosing a word to examine Wolfson's process, that word being: "'Tree," for example, is converted as a result of the R which recurs in the French word "arbre," and again as a result of the T which recurs in the Hebrew term; ..." (LoS p. 85) In this one sentence fragment we get the clues "Tree," "R" (= Resh = The Sun) and Hebrew (Qabalah is based on the Hebrew alphabet). This could still be a circumstantial coincidence until we get an even more definitive link to Qabalah a few pages later. Deleuze returns to examining the permutations of "tree:" "With respect to the Russian word "derevo" ("tree") the student of language is overjoyed at the existence of a plural form derev'ya whose internal apostrophe seems to assure the fusion of consonants (the linguist's soft sign)." In a footnote he writes further about the effect of the apostrophe upon the consonants; "... or as if fused by a yod." Crowley writes about the importance of yod in the esoteric alphabet: "The letter Yod is the foundation of all the other letters in the Hebrew alphabet, which are merely combinations of it in various ways" (The Book of Thoth) - Crowley continues with more relevant Yod symbolism). Bringing up a foreign word that's a plural form of "tree" as being "fused with a yod," makes for a blatant Qabalistic indicator; a sure sign. Now that it's been shown that Deleuze uses Qabalah, at least some of the time in his communication, we will examine and decode more complex messages presented through this Art in a subsequent post.